Today, emerging young professionals are experiencing increased pressure to develop and master their technical skillsets. Technical skills are also referred to as “hard skills.” They are specific, job-related skills that can easily be defined, taught, and measured. Unlike hard skills, soft skills are harder to define, quantify and teach. They include skills like time-management, communication, leadership, adaptability, etc. The growing emphasis on hard skills is causing soft skill development to fall behind. Although we expect soft skills to be developed early on in one’s career, schools and organizations rarely provide formal training on them. This results in a growing gap between employer expectations and how employees are showing up in the workplace. LinkedIn’s 2018 Workplace Learning Report shares that 89% of executives say it’s hard to find people with proper soft skills. This skills gap cannot be ignored. Below, we discuss the need for soft-skills training. 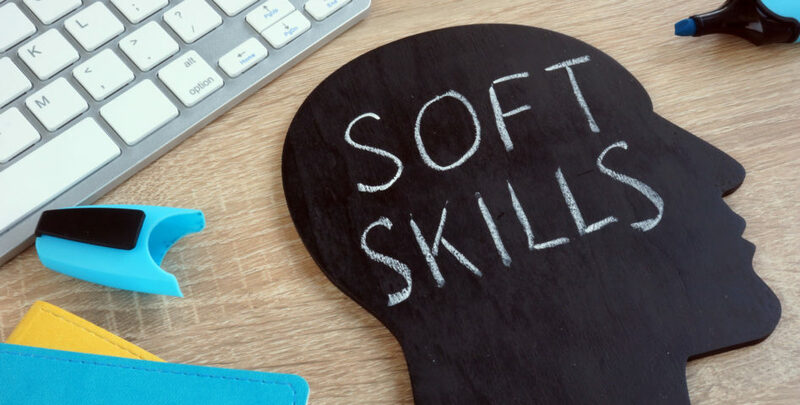 Research conducted by Carnegie Mellon Foundation has found that 75% of job success is determined by soft skills mastery, while only 25% is determined by technical skills. If this is the case, then why are organizations spending the majority of their training and development budget on job-specific, technical training? Research from the University of Michigan, Harvard, and Boston College has found that soft skills training makes you 12% more productive at work. Taking these studies into consideration, you might want to think about finding more of a balance between hard-skill and soft-skill training at your organization. Higher productivity and job success impacts an organization’s bottom line. In the study listed above, the organization investing in soft skills training received a whopping 256% return on investment. Imagine how it could pay off in your organization! Although automated technology continues to take over job-specific tasks, it won’t be able to replace soft skills like leadership, empathy and teamwork. In the age of automation, these skills are what will end up setting one employee apart from the other. What is now considered a skill that is hard to measure, could become the main performance indicator of the future. As we mentioned earlier, we tend to expect people to learn soft skills early on in their professional career. These skills quickly become habits. People who are not properly educated or trained on them can develop bad habits, which can be hard to break! These bad habits can negatively affect a team’s performance and morale, as well as customer experience and satisfaction. Considering bad habits are hard to break, the earlier an individual is aware of their expectations, the better. You might consider redesigning your onboarding to include soft skills training. Training your employees on these skills right off the bat will prepare them better for client interactions, improve team morale, and increase productivity and success rates, ultimately impacting your bottom line. In our next blog article, we will expand upon what the training might include, and how to administer it effectively. Until then, consider thinking about what skills you expect from your employees, assess their behavior against these expectations, think about what you might include in soft-skills training, and how it could be built into your current onboarding program.